9 Christina Aguilera Songs To Dedicate To Your Bae, From "What A Girl Wants" To "Candyman"
Christina Aguilera had a lot to celebrate on Saturday, Aug. 15. According to People, the "Your Body" songstress showed off her inimitable vocal range by performing previous hits — including "Lady Marmalade" and "Ain't No Other Man" — at the regaled Apollo in the Hamptons event in New York. The mother of two took time during her performance to announce, "This is a special weekend, it's my first daughter's first birthday." Aguilera welcomed her daughter, Summer Rain, a year ago with fiancée Matthew Rutler, who the star has been engaged to since Valentine's Day 2014. 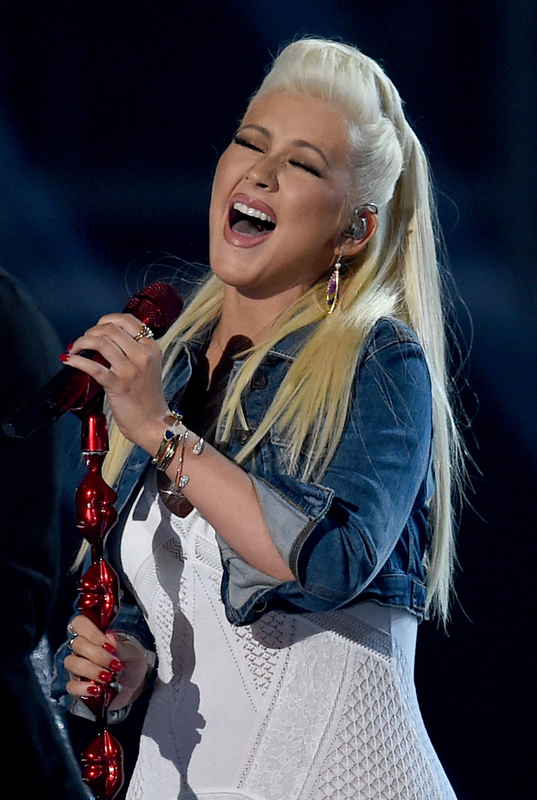 Following her announcement, Aguilera showed her bae some love onstage by dedicating a performance of Etta James' "At Last" to her hubby-to-be — and you just know she slayed it. While Aguilera chose a cover as her serenade, the singer has bestowed us with plenty of hits over the years that make for the perfect choice when looking to dedicate a song to the apple of your eye. Whether you are in the throes of that giddy period known as the "honeymoon phase," or you and your S.O. have been killing it in the #RelationshipGoals department for years, there is a romantic Aguilera track that can perfectly articulate your amore. In celebration of romance, let's take a look at nine Aguilera songs that will make your bae's heart sing. 1. "What A Girl Wants"
For those who have overcome the initial trials that oft come with dating, this song is the perfect way to let your S.O. know how much you appreciate them. 2. "Ain't No Other Man"
Use this addictive track to give your romantic serenade a jazzy kick. 3. "Come On Over (All I Want Is You)"
There's not a bae in the world that could turn down this type of invitation. If you're looking to get a little bit cheeky with your love, "Candyman" from Aguilera's Back to Basics album is quite the sassy choice. 5. "I Turn To You"
When you find the right romantic partner, that person becomes an integral part of your support system. Pay tribute to a bae that has been there for you through it all with this poignant ballad. If you're like me, the early stages of infatuation tend to be marked by nerves, copious amounts of giggling, and taking on an inflection that sounds a lot like Minnie Mouse. Romance sparks some potent feelings, and it can be difficult to act normal in the throes of it. Share your feelings with a new bae with this severely underrated ballad from Aguilera's debut album. Trust me when I say they're probably just as nervous as you are. 7. "Loving Me 4 Me"
This sultry tune is perfect for a bae who accepts every single part of you — as they should! Not only is this song beautifully romantic — it's the perfect way to coax your partner into re-watching Burlesque with you. 9. "Nobody Wants To Be Lonely"
Remember this one?! I know I do. Although this is technically a Ricky Martin track, Aguilera's role was particularly on fleek. Moreover, you can use this song both as a dedication, and as a selection for the next time you and your bae want to slay a duet at karaoke. Equipped with an amorous Aguilera track, you don't need to wait until Valentine's Day to properly woo your bae.